Business leaders were challenged to look at the wider export opportunities around the world, during a business breakfast this morning. “I trust all of you will be inspired to consider the options for foreign trade,” said Cllr Ruby Mathang, the MMC of Johannesburg City Council’s Department of Development. He was speaking this morning (Sunday 19 June) on the first day of the South African International Trade Exhibition 2016 (SAITEX) in Midrand to a gathering of more than 300 business chief and ambassadors from around the world including Vietnam, China and Indonesia. “it is a great pleasure to welcome you all to the 23rd edition of SAITEX,” said Cllr Mathang, who talked of the successes there had been for export business in South Africa, which is vital to the country’s growth. “We’ve seen South African companies competing pound for pound against multi-nationals,” he said. Then breakfast meeting included Cllr Parks Tau, the Executive Mayor of Johannesburg and the Deputy Minister of the Department of Small Business Development Elizabeth Thabethe, who also addressed the audience. The Business Breakfast was held on the first day of SAITEX 2016 and organised by the Progressive Business Forum (PBF), which has 5,000 members across the country, from small start-ups through to multi-nationals. Daryl Swanepoel is the Convenor of the PBF. He explained that the PBF worked with government and business owners to ensure that the country’s policies matched. 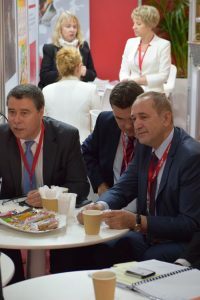 “Business and government must pull in the same direction,” said Mr Swanepoel, who added that the PBF visits trade shows around the world with businesses from South Africa enabling them to forge export partnerships in countries, including China, Brazil, Vietnam, India, South Korea and Russia. As well as hosting the business breakfast at the opening day of SAITEX, he said the PBF paid for its own stands and was not reliant upon government cash. And he explained that SAITEX offers business opportunities to South African traders that cannot be found anywhere else in the country. “The variety of SAITEX exhibitors is unique in this country and makes it the number one platform for trade promotion,” he said. SAITEX 2016 officially opened at 10am at the Gallagher Convention Centre in Midrand, with 400 exhibitors from more than 20 countries and visitors, who are expected to come from more than 50 countries. It runs for three days until Tuesday June 21. “This expo brings together manufacturers and distributors who can meet face to face and lets visitors see first-hand thousands of new products,” said Christine Davidson, Vice President of dmg-ems Africa, organiser of SAITEX 2016. The conference will steer delegates through current challenges, future market trends and opportunities for retailing in the year ahead, with discussions and debates around key topics and presented by leading industry experts. SAITEX has become the go-to event for retailers looking for new products where they can meet manufacturers and distributors face-to-face and see first-hand thousands of new products aimed at the southern African market and for South African exhibitors to explore export opportunities. Find out more about visiting the show at www.saitexafrica.com.